OOS International’s office is located in a monumental villa in Serooskerke in Walcheren, the Netherlands. Even though Serooskere is a small village, OOS is very proud of its origin and because of that, tries to give back to the community as much as possible. Mika Mathia lives in Serooskere, is 19 years old and wants to become a professional kart champion. To make his dream come true, he was looking for sponsors. Luckily Dragan Maslovar, who works at OOS International shared the same passion for karting as this local talent. ‘OOS. International was fast to react to the sponsor brochure that I had delivered at the office a week before. A meeting was arranged and from then on the sponsorship started’ says Mika. ‘My goal is to achieve as many beautiful results as possible in karting and try to continue from there in the sports car racing. To do so, I need to gain more experience by driving more international races. Competitions take place in all parts of the world, making especially travel and accommodation expensive. At first, we paid everything out of our own pocket and with OOS International’s generosity in supporting me financially, it makes it all a lot easier’ said Mika. Mika won third place at the Indoor Kart World championship in Italy in 2016. 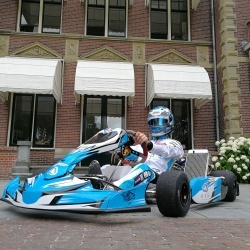 ‘In July 2016 I switched from indoor karting to outdoor karting, which was made possible by OOS International and my parents. My first year was mainly a year of learning as outdoor karting is totally different and a lot more is involved in comparison to indoor karting. You cannot master outdoor karting in just one year, but now in my second year the speed and the good results are showing’. OOS International is extremely proud of Serooskerke’s Mika and looks forward to seeing his new accomplishments in the future.